Australians heading to Bali have been told they are unlikely to face any cancellations or delays even though airlines are on 'red notice' after Mount Sinabung, on the island of Sumatra, erupted again. The regional volcanic ash advisory centre in Darwin has issued a red notice to airlines, which means the eruption is underway with significant emission of ash into the atmosphere. However, a spokesperson from Jetstar told nine.com.au that flights heading to Bali are unaffected, although they will be closely monitoring the ash-clouds movement. Billowing columns of ash shot more than 5000 meters into the atmosphere, but there were no fatalities or injuries reported as areas around the crater of the volcano, located about 1900km northwest of the capital Jakarta, have been off-limits for several years due to frequent volcanic activity. Hot ash clouds travelled as far as 4900 meters southward, with the top of the cloud reaching 7276 meters high. The volcano, one of three currently erupting in Indonesia, erupted in 2010, after lying dormant for 400 years, killing two people. Another eruption in 2014 killed 16 people, while seven died in a 2016 eruption. In 2014 around 20,000 people were forced to leave homes after 220 eruptions within a week. "In five districts it became dark with a visibility of about five meters," he said in a statement. 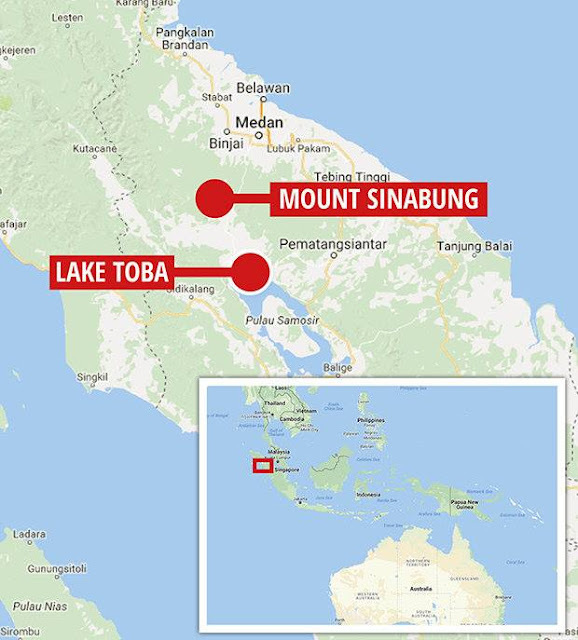 A worrying statistic not being banded around by the mainstream media is Mount Sinabung itself sits just 20 miles north of Lake Toba which is a massive supervolcano and is capable of plunging the Earth into a year without summer. Lake Toba is the site of a massive supervolcanic eruption estimated at VEI 8 that occurred 69,000 to 77,000 years ago, representing a climate-changing event. It is the largest-known explosive eruption on Earth in the last 25 million years. According to the Toba catastrophe theory, it had global consequences for human populations; it killed most humans living at that time and is believed to have created a population bottleneck in central east Africa and India, which affects the genetic make-up of the human worldwide population to the present. It has been accepted that the eruption of Toba led to a volcanic winter with a worldwide decrease in temperature between 3 to 5 °C (5.4 to 9.0 °F), and up to 15 °C (27 °F) in higher latitudes. Additional studies in Lake Malawi in East Africa show significant amounts of ash being deposited from the Toba eruptions, even at that great distance. A eruption from Mount Tambora and possibly Mount Mayon which is at this moment very volatile in the Philippines caused 1816 to be the year without summer. The year 1816 is known as the Year Without a Summer (also the Poverty Year, the Summer that Never Was, the Year There Was No Summer, and Eighteen Hundred and Froze To Death), because of severe climate abnormalities that caused average global temperatures to decrease by 0.4–0.7 °C (0.7–1.3 °F). This resulted in major food shortages across the Northern Hemisphere. Evidence suggests that the anomaly was predominantly a volcanic winter event caused by the massive 1815 eruption of Mount Tambora in the Dutch East Indies (the largest eruption in at least 1,300 years after the extreme weather events of 535–536), perhaps exacerbated by the 1814 eruption of Mount Mayon which is at this moment very volatile in the Philippines. So with a reducing / shifting magnetic field around the Earth, the liklehood of earthquakes increases due to less gravity holding the status quo for the plates, and more volcanic activity. Not difficult to see how things could snowball and temperatures drop rapidly and usher in the end of the current interglacial warm period.